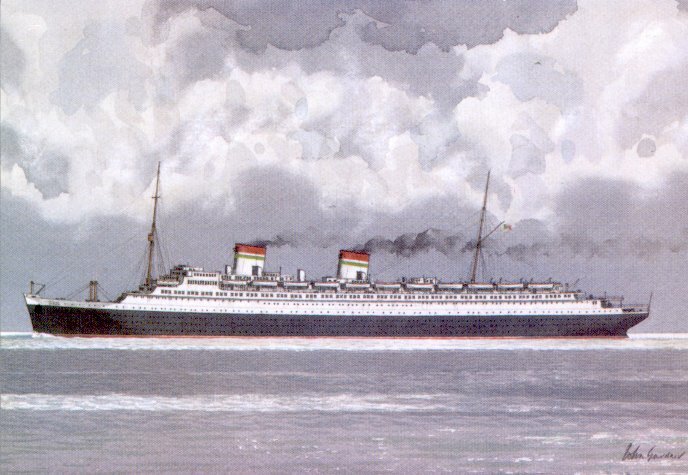 Rex, the largest Italian liner ever built, was also the only Italian ship ever to hold the Blue Riband. Built by G. Ansaldo & Co. of Sestri Ponente, she was launched in 1931 as Navigazione Generale Italiana's Gugliermo Marconi. During fitting out, however, she became the property of the newly-created Italia Flotta Riunite and was renamed Rex. Her maiden voyage from Genoa to New York began on 27 September 1932, but was delayed for three days at Gibraltar, where engine damage was repaired. By August 1933, though, there was nothing wrong with her engines and she set a westbound crossing record. She covered the 3,181 nautical miles from Gibraltar to Ambrose in 4 days, 13 hrs., 58 min., for an average speed of 28.92 knots, a knot better than the record set by NDL's Europa a month earlier. 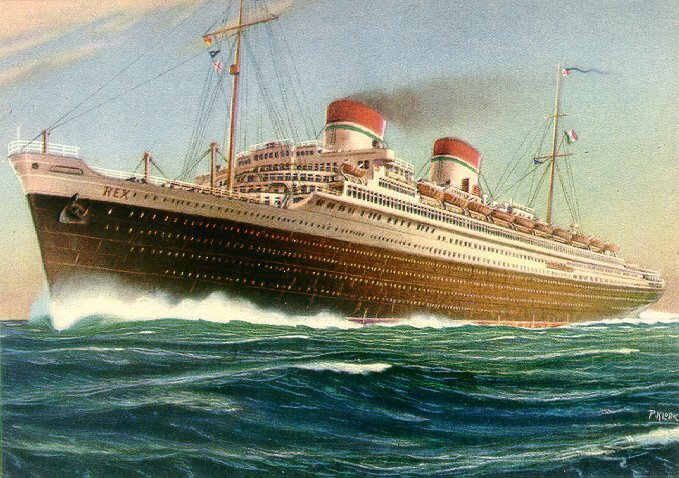 Rex would hold this record until Normandie's maiden voyage in 1935. In April 1940, Rex made her last Atlantic crossing. She was laid up at Bari and, later, at Trieste. Rex was not involved in the war because her large size was thought to render her particularly vulnerable. She remained laid up even after Italy's surrender in 1943, when she passed into German control. On 8 September 1944, off Capo d'Istria, she was hit by 123 rockets launched by RAF aircraft, caught fire from stem to stern, rolled onto her port side, and sank in shallow water. She was broken up at the site beginning in 1947. Sources: Bonsor's North Atlantic Seaway; Kludas' Great Passenger Ships of the World; Williams' Wartime Disasters at Sea.